Just a quick post for today. 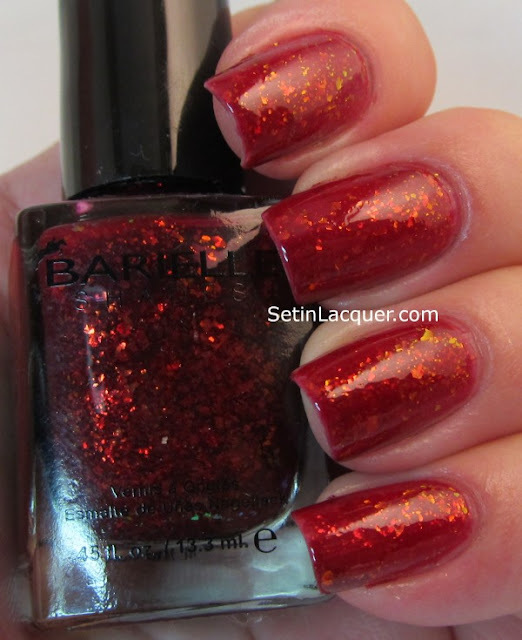 But I have a wonderful swatch for you - Barielle Elle's Spell. 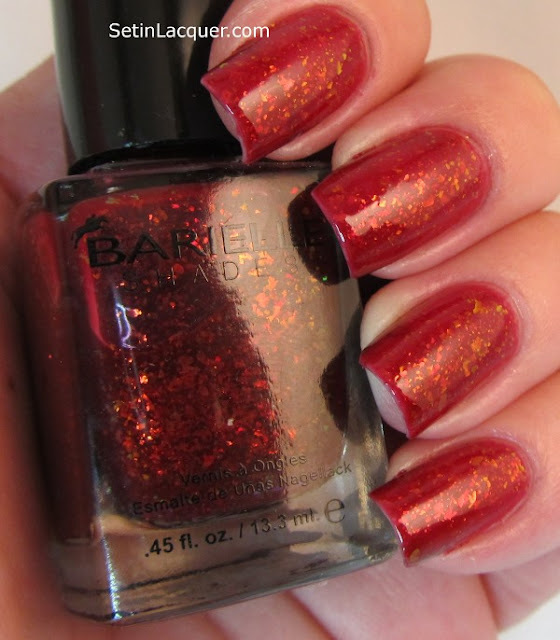 This polish is a sheer jelly with tons of shimmery shiny flakes. The flakes flash with a gold shimmer. This is three coats. The application was great. The polish applied smooth and the flakes applied with ease. Barielle has been around for more than 30 years and introduced "Nail Strengthener Cream" as the first nail care product of its kind. Originally formulated to condition the hooves of million-dollar thoroughbred racehorses, this legendary skin care product helps nails grow healthier and stronger while resisting splits, peels and breaks. Barielle is available for $8 from barielle.com. This product was purchased by me and all opinions are my own. The Zoya Gloss Collection. A sheer jelly collection from New York Fashion Week 2012. "Haute" off the runway. A new color collection for fall. Jelly polishes are a "buildable" formula. Meaning you can build the polish up to provide the coverage you want. I used three coats for each of these polishes. The natural sunlight makes them appear alot more sheer. These polishes have an extremely high gloss. I didn't use a top coat for these swatches and the shine is unbelievable! I completely love the finished look. These jellies have a depth that is quite stunning. I took photos in both full sunlight and in artificial light so the full range of color can be seen. 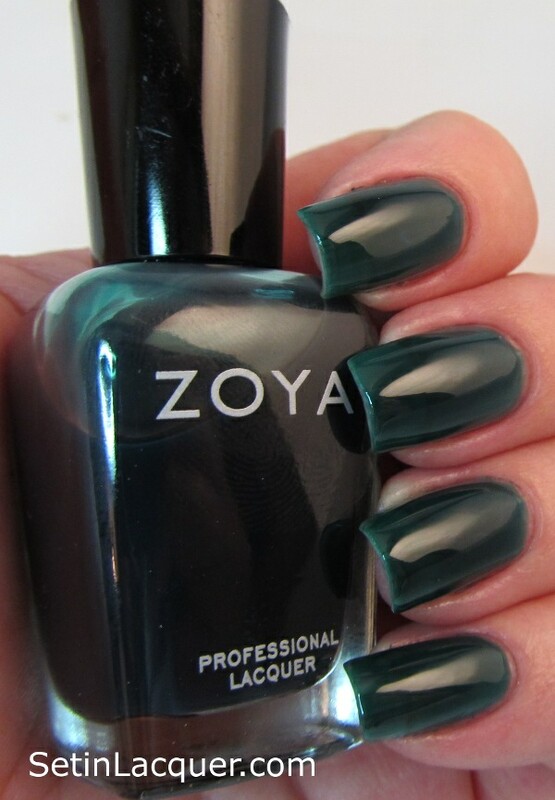 Zoya Frida is described as a sheer teal blue jelly gloss. In artificial light it appears as a deep blue/green. 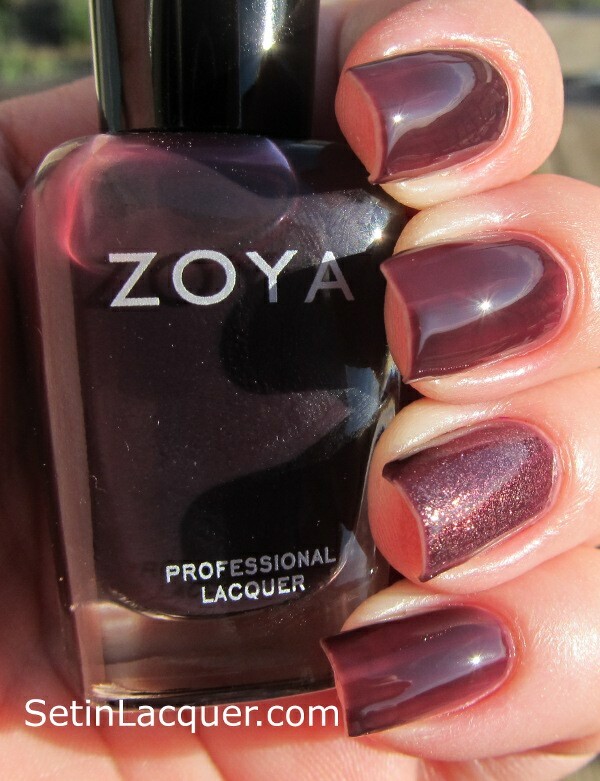 Zoya Katherine is described as a sheer aubergine jelly gloss. Katherine is a Peter Som custom shade. It is a phenomenal shade of eggplant maroon. I made a "jelly sandwich" on my ring finger with 2 coats of Katherine, then one coat of Daul (from the Diva Collection) and then one coat of Katherine. Zoya Paloma is described as a sheer berry red jelly gloss. It has gorgeous pink tones. I made a "jelly sandwich" on my ring finger with 2 coats of Paloma, then one coat of Zoya Kissy and then one coat of Paloma. I love this look. See the Diva Collection swatches here. The Designer Collection swatches are available here. Zoya polishes are Big 5 Free - all formulas are completely free of harmful industrial chemicals. Bottom line: I hadn't really tried too many jellies before this. Now I am wondering why. Although it takes a little patience I love the depth and the shine these jellies offer. All Zoya polishes can be purchased on their website at Zoya.com for $8. But if you haven't purchased from Zoya.com you can click on this link https://www.artofbeauty.com/rd/012F32AA and get a free polish. Add two more and get free shipping too! This is my "Share the Love" link. I love summer. It's full of picnics, barbecues, family gatherings, fairs... And when I think of a fair I can't help but think of all the homemade goodies - including jellies and jams. I recently ordered polish from Princess Polish. They arrived today safe and sound. Princess Polish has made some amazing jelly holographic polishes. Jelly polishes take a bit to build up on your nail and several coats are needed. But they are delightful polishes to own and have a lot of depth to them. These polishes also took a bit to build up. It took at least three coats to get to an opacity I was happy with. But I usually layer my jelly polishes over another. It's personal preference. The polishes applied wonderfully and had a relatively quick dry time. Let's just get to the photos. I was hurrying because I wanted to make sure I could get photos in the sunlight. But unfortunately - even though the sun was trying its best to shine bright - the wildfires nearby are releasing a lot of smoke and that smoke causes quite a haze. So you can't quite see the holographic goodness. If anyone is close to the fires or has property being threatened I hope you are safe and well. Blueberry Jam is one of my favorites. But then I am partial to blue. This is a wonderful azure blue that reflects the light in an astounding fashion. Grape Jelly is my favorite of the collection. A grape purple that isn't too bright, or too dark. It's like the perfect amethyst. Mint Jelly is the sheerest of the colors. This is four coats. This reminds me of lime Jello! Orange Marmalade is a gorgeous, bright, neon orange. Strawberry Jam is a delightful color. It is a rose pink shade that is deep and rich. Bottom Line: These are wonderful jelly polishes. The holographic sheen is obvious without being overpowering. This is a great new Indie polish line.